The Educators Teachers jobs are announced by the education department Recently. Nowadays In the Pakistan on of the biggest Center of attention job is Educators Teachers jobs 2018 that offers the various Positions Different BPS & Grades and Different Salary Packages for the Various districts. The Educators Jobs Announced by the Province wise Punjab KPK Baluchistan & Sindh by their respective departments. All the NTS tests are provided by the Subject wise. We are going to provide you the Educators teachers jobs 2018 NTS Test Online Mcqs for preparation Science & Arts Teachers Jobs for the various Positions ESE SESE SSE. You Just Attempt the Test with simply click on Start Button and then your Time will be start So these test will help you as a Sample Tests. Because All of these Tests are Made according to the NTS Test Criteria Subject wise and Topic Wise as well. The Test Preparation Online is provided online at your Home door step. 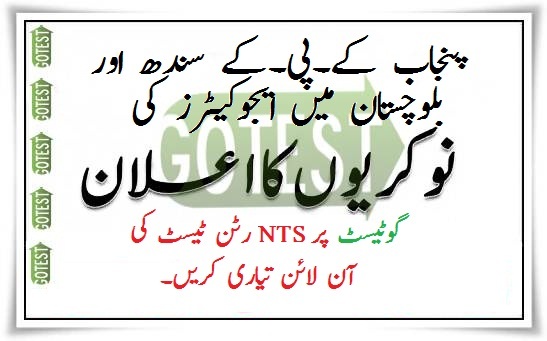 NTS Test of All Subjects like Current Affairs, Math, IT Skills, Urdu, Science, Islamyat Studies, English, Chemistry, Physics, General Knowledge are provided below for the Educators Teachers you can get the online Test Preparation of All these subjects & topics test free of cost. NTS Educators Jobs Online Test Mcqs and Sample Papers Notes for Preparation Syllabus ESE SESE SSE Science Arts Teachers as well. The Education Department When announces their Educator Teacher Jobs then they Assign the NTS Test to commence the Written Test for their Recruitment. Once a Candidates Apply for the Educators Teaches Jobs then NTS Analysis their Documentations and Eligibility that is candidates complying with the Policies and Terms and Condition of Educators Teacher jobs. If you are Eligible your name will be mentioned in the NTS Test Selected candidates lists and After that NTS Conduct their Test after the Test Clearance candidates will be referred to the education department for further procedure like Interview and final appointment formalities. plz sent me kpk sst math physc nts paper…. paper me konse question ate hai… take me asani 100/100 nbr le saku….